Welcome to my world, come start your journey to the world of Wildlife ! Wildlife is depleting day by day, hence we need to Act NOW! How would the world be without them? Yes, the ecosystem is incomplete without these wild animals. Have you ever wondered why should these animals should be protected? Have you done your bit to save them? These are probably the same questions asked by the same wild animals whom we are eager to see on our visits to National Parks or Wildlife Sanctuaries. I would like to express the views and also share what our beautiful animals feel! Carnivores: We represent the top of the foodchain in the forest. We eat the herbivores like deers, bisons, Sambar deer etc to stay alive. More the herbivores, more are our chances of survival. These forests are our only home, you are our guests hence, you need to follow few rules and regulations about behaving in our home same as you do when you visit someone else home. We do not guarantee that we will come to meet you, because your visit is sudden without notice except for the months where the forests close during rains. Our meeting is just luck or say we were at right place on right time. We want to take you back in history, during the 19th century our population was between 50,000 - 100,000 We were always sighted and photographed as we were in ample numbers, but over years due to poaching and no proper policy against such crime, our numbers have fallen drastically to 1800 by 1971, more depletion happened till the nos fell to 1400 by 2008. Government is trying to save us and so are some groups who love us, know that why is it important to save us? & will do everything they can to save us. This is creating awareness and people are now changing their attitude towards us, but we need more and we know also about the social media. Well you can post about the images you took of us but along with that if you can add a line about the conservation, we would be thankful and in turn promise you all types of poses we can pose. The numbers have increased to 1551, in 2011. It is said more than 2845 leopards were killed between 1994 - 2010. It is said for every tiger skin, there are at least 7 skins of leopards in haul. We know the numbers are depleting and it is happening rapidly. Government is trying to save and with the help of you all, our population of other species can be revived, we are talking about cloud or snow leopards. Please save us by conserving the forests & stopping the poachers from killing us. Herbivores: We are as important as others are in these forests. We represent the base of the food chain, wider the base, higher the top. The whole forest is an ecosystem and we contribute to it. If our homes are gone and we are killed for fun, then there will be an imbalance in the ecosystem & soon it will crumble to ashes and everything will be gone. Along with the annihilation of the forests, the climate will change and there will be destruction everywhere. Please save us and save the world. The herbivores include different types of deer right from Spotted - Barasingha & Gaurs. Elephants: What have we done to you humans? I personally do not understand what have they done, apart from claiming the lands which are theirs and they have all the right to take it back or wade through it, its like trespassing their property. How about this analogy - Imagine you have a piece of land, which has been there since your birth, but you hardly visit it and taking advantage of that few people have built their house and are leaving in peace. One fine day, you decide to visit it as it is been long time since you have visited the site. So you visit that site & find out about the people living their, now what will you do? Imagine what Elephants can do & understand Elephants are not as intelligent as humans are! So now after that back to them, where will we go? We come and try to wade along and then we are threatened by using crackers, sometimes even throwing lighted woods at us and more worse than it - run down by trucks! We are also an important part of these forests, killing us will again lead to an imbalance in the ecosystem. Birds & Insects: We are highly dependent on trees and different vegetation. We will die if our homes are snatched away from us. Also the poachers are a big threat to us. Our so many species are endangered & many of them are extinct. We are not only beautiful but are important to the development of these forests. We are major carriers of pollen along with the insects which help in pollination & apart from that we eat various type of fruits & our droppings help in development of forests. We along with the wild animals are an important part of the ecosystem. Please save us and save world. My Take: It is high time now, this needs to stop! These creatures do not invade our homes, in fact we have trespassed their homes. Certain areas are already declared as Elephant corridors, what are we doing in there? how come government are not helping them and not checking whether the areas are cleared or not? We are hearing everyday - one tigress electrocuted, another poached, these numbers might be small now, but tomorrow these numbers will multiply. Numerous Elephants are killed in the name of Elephant - Human conflict, but when we invade their homes, whose fault is it? What are waiting for? Are we waiting for these animals being almost extinct? Then, only we will take action right? because till we are thirsty we do not dug up the well right? Nothing is changed, we can still revive them, only if the government becomes little stringent on this important matter and we as citizens start spreading awareness and inculcate the ideology of conservation of forests in the minds of future leaders of India. I do not say the government is not taking action, but what is the use of corrective action, when we can take preventive action! The government needs to be little more strict and take actions in such a way that poachers are compelled to think twice before committing the crime. My only humble request to all of you is to be aware and spread awareness about the conservation o forests and the wonderful animals who reside in it. One more important point is that tiger is not wildlife, nor it is compulsory that one will see big cats. 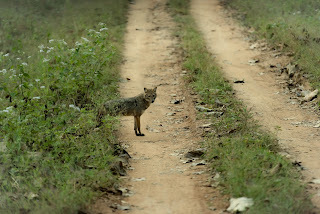 Wildlife is everything which resides in the forests right from Cats to animals to birds to insects. Also do not make any type of noise even if you spot a tiger, because when we are silent then we listen to the noises of forests which in turn helps the guide or naturalist to recognize the calls made by monkeys and herbivores, when the predators are around. Also keep an eye on the pug marks, as pug marks and the calls help in identifying the spot of the wild animals. SAVE FORESTS! SAVE WILD ANIMALS! 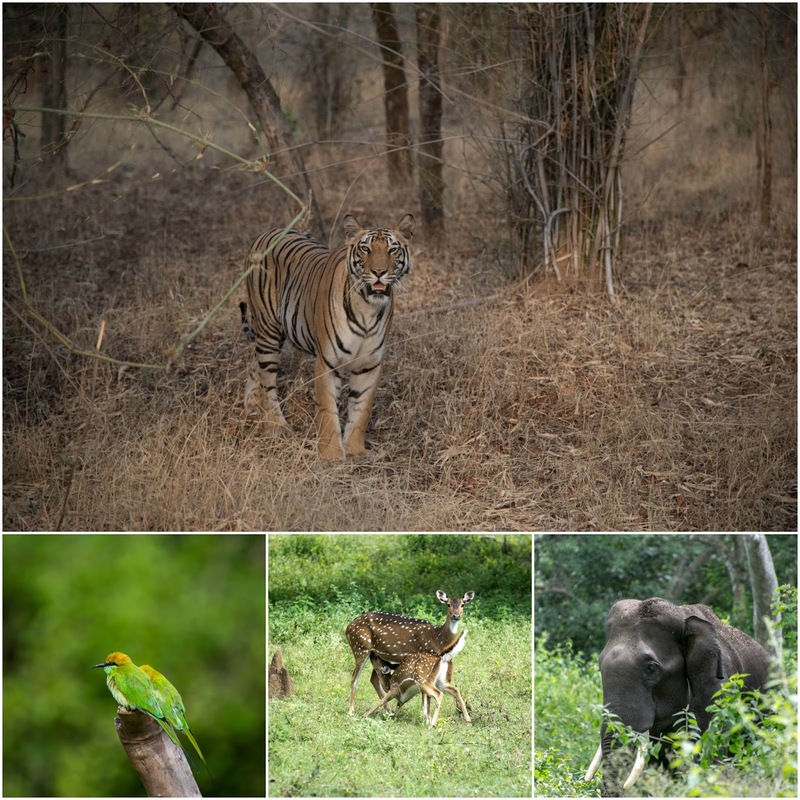 Ranthambore, the land of tigers! 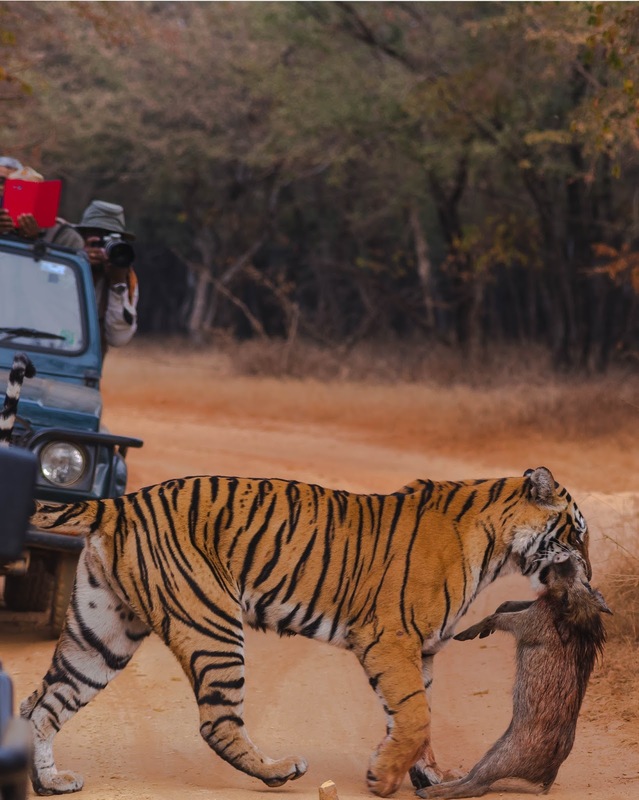 Ranthambore National Park is different from the lush and evergreen forests of South India. This was my first time in Ranthambore, it was all together a different experience. It has a different terrain from the South Indian jungles. It is a deciduous forest, which is quite open and rocky. It has got some beautiful landscapes, which one cannot miss. It has two mountain ranges meeting each other - Aravalli & Vindhya hill ranges, thus creating one of the best landscapes in India. Owls - I still fancy seeing them, but yes when I was on the way to Ranthambore National park, I had few targets apart from Tigers & Leopards, I wanted to photograph Owls. RTR did not disappoint me in terms of Owl, the first one I saw was Brown Fish Owl, I apologize for not having any images, as it was morning time, low light & it flew as we approached it on the way to third zone. So I was in my 5th safari & this was in the morning, I had no luck spotting any big cats. Since, I had no luck spotting the big cat, I was looking for Owl, as I had missed clicking Brown Fish Owl, so RTR had to compensate & it did, that too in style. One common thing about all the owls is their camouflaging abilities. They know very well to camouflage and blend in with the surroundings. This helps them to be safe from their predators and catch their prey easily. As we know, they are nocturnal and hunt in nights while sleep with one eye closed during days. Now it was morning safari, as usual looking for the pugmarks of Arrowhead or leopard or sloth bear, we were very happy to see the pugmarks which were of Arrowhead, but alas the ending was very sad, as it had just gone in from the four roads. Now, I thought this was it and another dry safari, but there was a happy ending to the morning. We were passing through the forest path, when our guide Mr. Shard Sharma, suddenly whispered, "Sir, there is an Indian Scops Owl", & pointed towards the tree and believe me it was perfectly camouflaged, one cannot easily differentiate between the bark and the owl. It was beautiful, but asleep and we waited till it opened it's eyes, then we had good amount of time to capture it. Owls do not like noise or commotion, & they love being alone so as to avoid getting disturbed by people and thus they have the best camouflaging abilities. Again a small note and advice to young generation - Please save forests and save wild animals. Avoid making sounds during the safari, this in turn will help your guide and driver to spot the wild animals & give you a better chance to photograph them. SAVE FORESTS & SAVE BIRDS and ANIMALS! 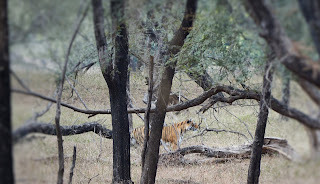 Ranthambore, the land of tigers! My 1st National Park on the wishlist, and I did it in two years. Ranthambore National Park is different from the lush and evergreen forests of South India. This was my first time in Ranthambore, it was all together a different experience. It is different from the lush evergreen forests of South India. It has a different terrain from the South Indian jungles. It is a deciduous forest, which is quite open and rocky. It has got some beautiful landscapes, which one cannot miss. It has two mountain ranges meeting each other - Aravalli & Vindhya hill ranges, thus creating one of the best landscapes in India. Ranthambore is one of the largest National Parks of India. It is spread in 1700 sq area, of which 20% comes into the tourist zone. The tourist zone are is divided into ten zones, out of which one to five zones are core zones. Those five zones are where the activities of predators can be seen regularly. Third zone is a beautiful zone with three lakes, namely Rajbagh, Padam & Mallik. The Mallik lake also share the border with fourth zone. The total no of tigers present in the park is 55 tigers, out of which 30 tigers are in the tourist zone. Apart from tigers, the park has Leopards in the predator category, while there are Sloth Bears, Spotted Deers, Sambar Deers, Blue Bull or Neelgai, Indian Gazelle or Chinkara, & Hyena. The birds include Kingfishers, Owls, Buzzards, Vultures, Eagles and many more. Crocodiles can be seen in all the lakes and there are instances where there has been a fight between crocodiles and tigers. Macchli the legendary tigress, is the one who is responsible for regeneration of the tiger population. She is the most photographed tigress in world! 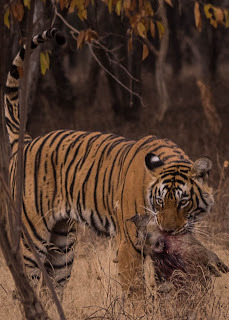 She killed a 14 foot long crocodile, after which she was declared the Queen of Ranthambore, and this title is given to the tiger/tigress which controls the three lake zone. Ranthambore is one of the best places to spot tigers in their habitat and they can be seen everywhere in park. The best months to be at Ranthambore is in May & November. May is the last month of summer season & in summer the water is scarce, so they come out to the water holes to drink water, thus increasing the chances of sighting. November again because it is the start of the winter season, also because its just after the breeding season, where we can see new fauns and cubs as well. Ranthambore is situated in Sawai Madhopur district of Rajasthan. It is well connected by road, rail & airways. Nearest railway station is Sawai Madhopur 11 kms away, Nearest Airport is Jaipur 160 kms away & 110 kms from Kota. There are various hotels in and around Sawai Madhopur and I stayed at Ranthambore Regency, which had lovely food and stay. So I reached to Ranthambore on 13th December and my first safari was at 14:30 hrs. Mr. Sharad Sharma was our guide for all the safaris. Within 15 minutes into the safari, we saw few gypsies hovering around a place. Once we reached there, I saw a faint figure of tigress, I knew I was in for treat. One of the Nature Guides shouted:" Nalleh mein jayegi, Nalleh mein" , still I did not know, what next is going to happen, as it was quite possible it could go more deeper into jungle where we cannot go on gypsy or it could just come in front of us. So I was waiting to see, what drama will unfold in front of me. She was watching a group of wild boars unaware of her presence. Then she vanished into the ruins and I thought now we might not see her again. Whatever happened next was in fraction of second, she just leaped on her target and kaboom!!! She had the piglet caught by it's neck. 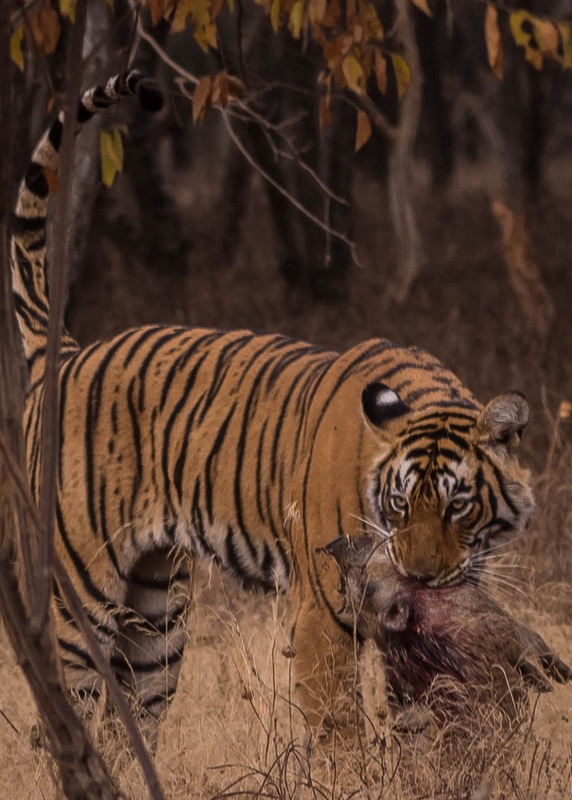 Tiger or predators normally catch the prey by it's neck, thus strangling its breath and eventually killing it or first they catch the prey by it's neck and then comes a paw thrashing on the prey's head thus giving it no chance to fight back. Next, we had her for 15 minutes giving us the images of lifetime. She was none other than Tigress Arrowhead (T-84), one of the famous tigress from third litter of the dominant female tigress T-19 or Krishna. She is a sub adult tigress and has a brother by name Pacman. Their father is the dominant male T-57 or Star. She is very bold and is fond of cameras. She then went towards the canal and from which it did not come out till that day. This was the best sighting I had ever had of tigers and the cherry on the icing was the hunt process. She gave us the demo on hunting process. She is very beautiful and the arrow can be seen on it's forehead. After that safari, I did not see her again till the end of all the safaris.